The "Next Generation of Cool" products will not only keep you cool, but they have been designed to keep you looking cool as well. 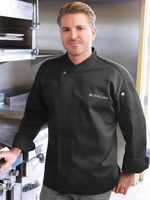 The Cool Vent products, Signature Series line, and state-of-the-art fabrics, all from Chef Works, have been awarded the UNIVATOR award for the most innovative uniform products, three times in the past four years. The line has been expanded to include ventilation and moisture management technology into many of our chef coats, kitchen shirts and headwear options. The Professional Series Pants are also constructed in light weight UltraLux fabric to maximize your comfort. How Does It Work? CHEF WORKS MOISTURE MANAGEMENT TECHNOLOGY wicks heat and moisture away from skin. It allows cool air back through to the body. It encourages evaporation, keeping you cool and comfortable. We encourage you to try some of the amazing "Next Generation of Cool" products, we think you'll enjoy the difference you feel.